Owners of Nissan’s new electric Leaf say they were given misleading information about the car before buying it. They say charging the Leaf can take three times longer than claimed on Nissan’s website. Others are unhappy that the range on a single charge is not as good as the 235 miles (378km) they were promised. Nissan admitted that charging times can vary, but denied there was a problem or that any customers were misled. The Advertising Standards Authority is now considering whether to launch an investigation into the issue. As many as 2,600 new Leafs have been sold in the UK, and it was named Electric Car of the Year for 2018 by What Car? magazine. But drivers attempting longer journeys in the Leaf have found themselves spending up to two and a half hours at motorway service stations to recharge. Last year, Nissan told prospective buyers that using so-called rapid chargers should only take 40 minutes "in moderate driving conditions" for an 80% charge. They subsequently changed that to between 40 and 60 minutes. There appears to be no problem with the first two charges on any given day – one at home, and then the first rapid charge en route. It is only when drivers come to charge for the third time – or the second rapid charge – that some have said they face long waits. Potentially, that could affect any journey of more than 250 miles. John Weatherley, a company director from the Forest of Dean, loves his Nissan Leaf. But when he made a 300 mile journey to the Lake District, he found himself waiting for a total of two-and-a-half hours when he stopped to charge for a second time. "If Nissan at the start had said what the car is capable of, without exaggerating the fact on their website, I’d have been fine with it," he told the BBC. "They said they could charge in 40 to 60 minutes, so I believed them. But it’s not true. The advertising is totally misleading." When Mr Weatherley wrote to Nissan to complain, he was told that rapid charging was only intended for use once in a journey – something many buyers may be unaware of. Nissan also told the BBC that charging can take longer than advertised, depending on conditions. "External ambient temperature, the type of driving you’ve been doing beforehand, and the heat you put into the battery if you’ve been doing successive charges can impact the timing," said Gareth Dunsmore, director of electric vehicles for Nissan Europe. He said the battery automatically slows a charge, to preserve its longevity, and to act as a safety mechanism when it gets too hot. "We make this clear in the owner’s manual," said Mr Dunsmore. In some instances it can also be the charger itself that is to blame, he said. Tony Pitcairn, from Ilkley in West Yorkshire, had problems on a 290 mile drive to Somerset. He and his wife spent 90 minutes at a motorway services in Gloucestershire. But Mr Pitcairn was also disappointed by the range of the new Leaf, which he bought specifically for long journeys. His marketing brochure claimed the car could do 235 miles on a single charge. But having bought the car, he found the range was actually 155 miles. "That was a disappointment to start with," he said. "So we have, in my mind, been misled twice, because the claimed range on a full charge is not 235 miles. Secondly, nowhere does it say that you will only be able to rapid charge in 40 minutes only once." When journalists from What Car? tested the new Leaf, they found a "real world" range of just 108 miles. Nissan said the original claim of 235 miles was correct under an official means of measurement known as the New European Driving Cycle (NEDC). However, as carmakers have moved to a different measure – known as the Worldwide harmonised Light vehicle Test Procedure (WLTP) – the range is now officially 168 miles. Mr Dunsmore advised any upset customers to get in contact: "Come and speak to us if there’s anything you’re not happy with." Meanwhile, a number of customers have cancelled their orders. Matt Beard, from Aberdeenshire, did so after taking a test drive. Eventually he bought the older model Leaf instead, which has a less powerful battery, but fewer problems when charging. In a tweet, he said he was shocked at how bad the problem was. Others are unhappy with the response from Nissan. 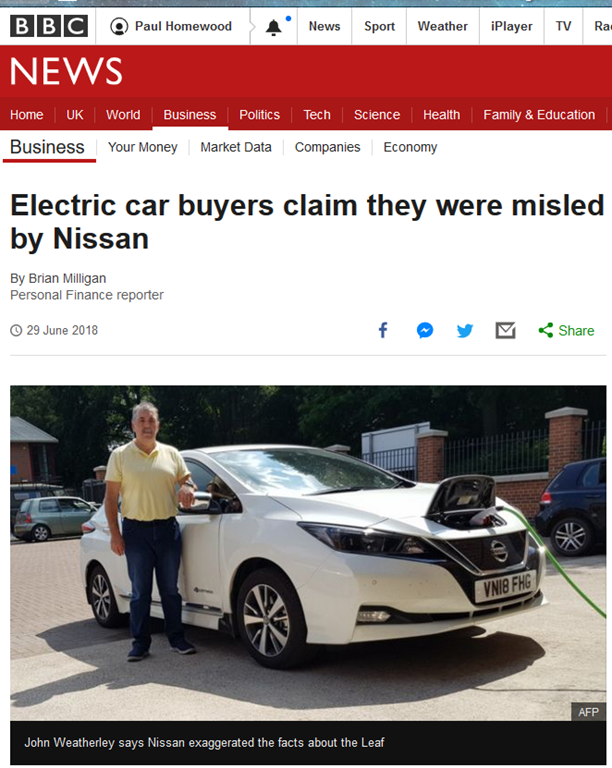 Jonathan Porterfield, of eco-cars.net, who regularly drives electric cars from Leicester to Orkney, was the first to report the issue. "I don’t want this episode to knock Nissan, but at the same time they need to sit up and take notice," he said. "Just telling people you’ve got to wait longer at a rapid charger – it’s not good enough." If Leaf buyers really believed Nissan’s claims, they must be even more stupid than I thought. And if they are moaning about a 90 minute change, what will they do when there is a queue in front of them when they arrive at the public recharging points? Book Bed & Breakfast? And what will owners do when its a cold morning and the electricity companies drain the charge on cars being charged so that everyone can make their breakfast? And your “smart meter” tells you to pound sand. According to graphic a 100% charge is 2 hours of driving, but a 50% charge is only 30 minutes. My math must need retooling. This article summarises the real problems still outstanding, with electric vehicles. Namely charging, range and in general the battery technology. Yet to be revealed, the true life and cost across the cycle of the batteries. Many have sold their EV’s a few gone to hybrids, most back to fossil fuel vehicles. ..instead they pretend they are having a big success. I did spot one Times commenter the other day saying he was not suffering efficiency degradation with temperature. I know it is nothing to shout about but yesterday did a trip of 200 miles from Somerset to home in three and a half hours, didn’t need to stop, but of course I use a good old diesel! And next week it will be a trip to Lake District, 330 miles. probably only have to stop for driver change. Yes with EV probably would have to be an overnight stop. mind you Motorway motels will love it. What happens with the 2 hour free stop limit at Motorway services with an EV!!! 450 miles to Scotland, from Dartford, in a petrol Skoda Yeti. Where possible (and safe) cruising at 90 MPH. One necessary stop (apart from the inevitable toilet stops) a splash and dash for £20 of petrol. Total journey time, around 8 hours. I have done the same journey in a diesel Mercedes E Class without the splash and dash. Nor did I have to spend a small fortune on service station lunches, crisps and magazines, or tolerate kids whinging about being bored cos’ there’s nothing to do! EV’s have a long way to go with no technology evident to get them there. Roll on the breakthrough though. When they can do 400 miles on a charge, take ten minutes to recharge, don’t cost 30% more than an ICE car, aren’t government subsidised, and a government diktat isn’t forcing us to buy them, then I’ll seriously consider one. We’ll be able to teleport by the time all that happens. My sentiments exactly. When I can get the equivalent range and charging time as my internal combustion engine, I’ll be receptive to their sales pitch, but not a minute before. The vast cost of EVs is simply not factored in to the cost estimates by governments. 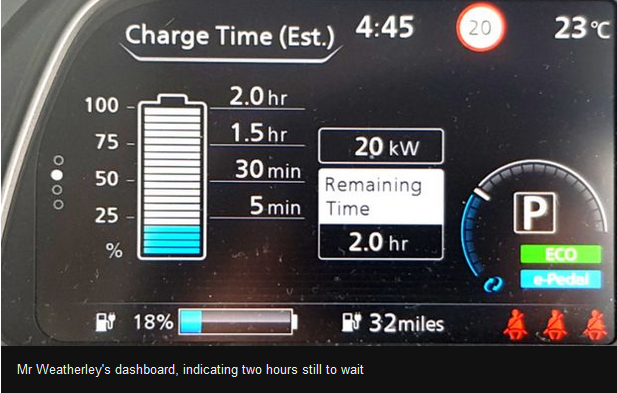 Unlike say HS2, where 30 minutes lower journey times is worth (falsely) claimed to be worth billions, the additional time required for relatively short journeys in EVs caused by the need to recharge is apparently free! If you have to recharge twice, and your EV is a bit old and you don’t use the fast recharging, that take between 2 and 6 hours or more. At say £100/hour, that’s an additional cost of between £200 and £600 per long journey for every single user. NO doubt many people will end up not taking the journey, which results in the loss of value you would otherwise have had. It’s difficult to quantify, but what is the cost of say reducing visits to elderly parents from 6 to 3 times year? What will your smart meter do when you are charging a heavily depleted EV car battery on a cloudy calm day? The government banned incandescent light bulbs because they were using too much electricity so surely we should ban EVs?? EV’s only glow when they spontaneously combust. If What Car found the range to be 108 miles how did they make it car of the year? Lied and collected a nice kick-back from Nissan? I can believe that, but what competition did it have? Certainly nothing like ICE’s have. The New European Driving Cycle (NEDC) is bit like the current Climate Change hype. Believe it at your peril. Long journeys in the depths of winter in an EV will be quite dangerous. Is the UK on miles or kilometers? It is against the law to post ‘km’ or road signs. An informal group will complain if they see such, and contact authorities. Nothing funny about it. The U.K. has a completely logical system of measures, based on natural units which are thousands of years old. As a matter of fact, some of the capacity units come from the Middle East, and were used in international trade four thousand years ago. There are supplementary road-side markers on many routes, which use kilometers. The fact that they are in kilometers is not stated on them, so the average person is hardly aware of what they mean. But if you break down on an English [sic] Motorway and phone for help, the Emergency Operator will ask you to look at the nearest blue marker (there is one every five hundred meters), and read out the symbols on it. She will then know exactly where to send the police. If people believed the hype, and admittedly this comes from our ‘objective’ BEIS, Dept for Transport, Defra et cetera, from the green goon squad – NGOs and the corporate giants not least NISSAN but if you do swallow all the hype, then you don’t deserve much sympathy – none. Government’s lie – really they do, since we joined the big lying squad over in Brussels – lies are what HMG do. You may not have noticed but since circa 1988, there is a false agenda here and some people are going to get hurt – financially! Not least the poor bu88ers (taxpayers) who subsidize (@ £5 K a pop) the galivanting green dingbats who bought the bumpf. All round, based on a lie, to combat a non existent phenomena and by way of useless, actually more than useless palliatives and boondoggles – electric cars – are moonbeam tech’. Some people say that Michael Gove is a very intelligent man and number one in the list for next PM. If he is truly intelligent then he must have been heavily bribed to swallow the EV lies to the incredible extent that he has. If he is as I suspect a total idiot then no way should he ever reach that position. With the current generation of politicians a total idiot is amongst the top 20 in the intelligence stakes. Our politicians live in the same bubble pretty much no matter what party or wing of a party they represent. They hear the same arguments, the same opinions, the same claims and rarely if ever hear anything different. And they get advice from SPADs and civil servants that simply echo all of that. The recent Windrush issue illustrates that well. No doubt some wholly innocent people were horribly mistreated, but the polling showed that a very large majority of people supported strong controls and action on illegal immigration. Yet for some bizarre reason, a senior minister resigned for doing what 65% of the population wanted her to do. Instead of saying “we made a horrible error with a tiny number, but the policy is right” she grovelled and quit. Once again, a minority issue dominates the will of the nation. When I go to my brother’s in Knoxville, TN for Christmas it is 420+ miles. After dealing with the mountains in WV, I stop well across VA for my fill-up and on into Knoxville in ca. 7.25 hours. Filling up takes about 15 minutes including a trip to the bathroom. Now, let’s get real. My sympathy runs shallow. This sounds like the excuses given to tobacco companies by those who consumed their products for decades and experienced the associated health problems. Cigarettes were known as “coffin nails” in the WV lumber camps as far back as the 1880’s when Shay engines allowed for the efficient lumbering of the steep terrain. More than a few have warned of all the problems with electric cars they are whining about. Paul had a whole column on the problem to come with the need for vast numbers of charging stations. They just did not listen as they wanted their friends to think them environmental saints. And as economist Dr. Thomas Sowell says: “Reality is not optional.” Welcome to reality. Seen in today’s paper (Guernsey Press)…beware your electric car going wrong in an isolated place (like a smallish island) even if it’s still under warranty, because the shortage of qualified e-mechanics there means that you will have to transport it somewhere at your own cost to have it fixed. 1. The default is zero or ultra low emission at tailpipe with alternatives considered only in exceptional circumstances: any diesel car alternative must be certified as meeting Real Driving Emissions (RDE) standards (Euro 6d-TEMP or Euro 6d) where possible Euro 6d. This looks good but should be qualified. I’m happy with the zero emission spec. as the only way such a vehicle will generate carbon dioxide is when it is recharged via the electrical grid. On the other hand, hybrids can run on petrol power and, once the battery is depleted, can be as polluting as a normal petrol vehicle, if not more so in view of the extra weight it has to drag around. An example of this was seen in a recent comparison test between two Diesel-engined cars and a hybrid. Over the test cycle, the Diesel cars achieved 146g/km and 139g/m, whereas the hybrid emitted 161g/km. The problem with hybrid vehicles (which you will know if you have one, perhaps), is that without access to charging facilities, they soon run out of battery life and are back to conventional engine power. So, it’s not enough to specify “ultra low emission” as an acceptable standard without qualification, ie need would have to be for low daily mileage with guaranteed access to charging facilities. How many government/public sector car users can meet that standard? Just saying “ultra low emission” and not actually policing the usage is just lip service at best and, potentially, adds a significant purchase and running cost penalty for the taxpayer to absorb. No wonder the cost of climate change policies is £100BILLION, according to an independent study. How about “Every Little Helps”? All Government Departments and their related organisations must meet the minimum mandatory Government Buying Standards when buying goods and services. We also encourage the wider public sector to specify the minimum mandatory standards in tenders. With regards to the Government Buying Standards for transport and the reference to ‘ultra low emission at tailpipe’, the Office for Low Emission Vehicles (OLEV) defines an ultra low emission vehicle as one that emits less than 75 grams of carbon dioxide for every kilometre travelled. Fleet operators remain responsible for making vehicle purchase decisions based on the duty cycle of a vehicle. They must consider daily mileage and access to charging facilities when considering whether or not an ultra low emission vehicle is appropriate. The Government is investing E3.sbillion in air quality and cleaner transport, including £1.5billion to support the uptake of ultra low emission vehicles to 2021. Thanks to the Government leadership, a growing private sector and local authority engagement, the UK now has over 11,500 publically (sic) accessible electric vehicle checkpoints. This includes over 900 rapid chargepoints, one of the largest networks in Europe. Our grant schemes and the public-private charging Infrastructure investment Fund will see thousands more electric vehicle chargepoints installed across the UK. Highways England has a £15million commitment to ensure there are chargepoints (rapid where possible) every 20 Miles on 95 per cent of the Strategic Road Network. If buyers “… must meet the minimum mandatory Government Buying Standards …” can’t even get purchases like disposable gloves right, what chance is there for cost-effective purchases in this area? Whilst my main concern was with hybrid vehicles, the latest information about electric-only vehicles makes the situation that much worse. What a criminal waste of taxpayers’ money. If, “the Office for Low Emission Vehicles (OLEV) defines an ultra low emission vehicle as one that emits less than 75 grams of carbon dioxide for every kilometre travelled”, that would exclude most hybrids, surely? Mr Pitcairn bought an electric car for long journeys. I think effing moron covers it. It takes me about 5 minutes to fill up at a service station as mine only has a 50 L tank. If an electric car needs about 2 hours then that raises an interesting problem. Service stations will have to be bigger. Much bigger. Simple arithmetic of 5 min vs 2 hrs says 24 times bigger, just to handle the long wait times. You couldn’t have 24 times more service stations as the profit made off motorists wouldn’t be enough to keep so many in business. Indeed the cost of such a large chunk of real estate would mean a much larger markup than current service stations charge – just to pay for the extra land. The service stations in my area I guess would be about half to one acre in size (0.2 – 0.4 ha). That suggests they would need to be 12 – 24 acres to (5 – 10 ha) have enough room for all the electric cars. A big service station at 24 acres would be a square about 350 yards on a side. Or about 10 city blocks. Just walking to the central payment office and back could take 10 minutes. Must admit I had never thought about EV’s from that perspective. The cost of the land would be huge, the extra fast food consumed to pass the time and the resulting health costs as a result, would also be huge. How many charging points are there at the average wayside petrol station? Also, many of the bored motorists will be smokers! Never buy an electric car. If you must have one, lease it. Sounds as though a couple of those puppies should have been sent to the engineering unit at West Virginia University (WVU) which found the VW emissions shenanigans on a grant of $50,000. They are not fancy, but they get results. More studies are being tossed their way. Another collision of green dreams and hype with reality. To those morons who have been stupid enough to buy a fully electric car. It serves you right. Just remember there’s one born every minute. You are forgetting the most objectionable part of a fully electric car. SUBSIDIES to buy the car and SUBSIDIES to charge it. It doesn’t ‘serve me right’ to be the one involintarily paying into these schemes to help those who can afford a brand new toy with their payments. No. It doesn’t ‘serve me right’. Good article on No Tricks Zone today on EV’s. On German TV they have been pronounced as climate killers. Having owned and loved the 30kWh leaf we bought the new 40kWh one. The first day we owned the leaf we took a long weekend in Scotland driving from our home in Peterborough. The journey took 3.5 hours longer than we had calculated because of slow charging. We thought we had unluckily had faulty chargers and reported them to Ecotricity. It was only on the journey back that we realised the car was faulty and reported it to the dealer. They asked Nissan who said it wasn’t faulty and that was just how it is. I’ve committed a large chunk of my income to this car and although it is great to drive it simply doesn’t do what it should. The manual is enormous and I could find no reference to this design fault in there when I looked. On complaining Nissan just told me to go to the ombudsman.